Biker Or Not is a social platform where motorcycle riders and enthusiasts can meet other biker singles for dating or friendship. It has all standard social networking features like the ability to add friends, send messages or make posts on your wall, and it is 100% free to join and use! All its features are unique and costomized for bikers. It has other special features like ‘Rides and Events’ where you can plan your next tour, “backseats”, to join or invite interested biker singles for a ride to your next tour, and “garage” where you can display your motorcycles for your profile visitors to see. Also, if you are a bike seller you can register with the “motorcycle store” on the site to reach out to interested buyers online. Read our detailed review on Biker Or Not to learn more! Biker Or Not is 100% free. To become a member, you are required to provide your email, choose a display name and a password, select your gender, birthday, and click on ‘create account’. Alternatively, you can choose to sign-up with your facebook account. After registration, you will be able to build your profile, fill your personal information and your interest, and you will be able to uplaod your photos. You will aslo be able to view profile of other members, check Their photos and send them messages. You can join other members in the chat rooms or make specific searches on members. It is free to use with no hidden charges attached. It has s mobile app for android devices. It has a simple UI design and the layout is easy to navigate. It is a social network for bikers and not a perfect place to look for a date. There is no live support or a background check to verify authenticity of members. 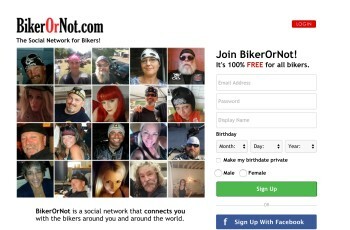 Biker Or Not is a social platform for bikers or motorcycle riders from around the world to meet for friendship or dating. It has been in operation since 2001 and has won the interest of biker men and women from different parts of the world. The site is 100% free to join and use with no hidden charges. The site welcomes all biker singles that wants to enjoy motorcycle culture discussions with local biker friends online to join its over 500,000 members on its platform. It has all basic features of a social site and has special and unique features for bikers. As a member, you can hook up with lone riders as a “back-seat” in their tours or find a riding partner. Whether you own a bike or not, Biker or Not promises to satisfy all your social needs and you should join this site if you have passion for motorcycles and tours! You can join, register your profile and use all the features for free. You can send and receive texts anytime of the day on the site. You can enjoy video chats with friends and also join video chat rooms. You can share your motorcycle events memories and find riding friends with a special tool on the site. You can join other sellers online in the “motorcycle store” to display your motorcycles for sale. You can also display your motorcycles in your “bike garage” for friends to see. You can learn about rides and events near you and plan your rides with its online tools. Easily find riders with empty backseat or signify if you need a backseat partner for your next ride with the “find or fill a backseat feature”. 100% free to join Biker or Not and use.